Jim Pettit, CEO of Aben Resources, speaks with Peter Epstein of Epstein Research about his company’s projects and summer drill plans.
. Aben Resources has a number of things going for it. A tremendous management team, Board & Advisors, a high-grade discovery, and nearly 24,000 ha of property situated between the Kerr Fault (the major structural feature in the Golden Triangle) and the “Hazelton/Stuhini” contact (keep reading to learn the importance of this!). A lot of excitement last year, please give readers the latest snapshot of Aben Resources at the beginning of April, 2019. We are on track, setting up the program for our third year of drilling at Forrest Kerr, in the Golden Triangle (GT). We have three really good targets to start with at the Boundary zone. One is slightly north of the North Boundary zone, (NBZ). It came to us though 3D modeling. In the South Boundary zone, we have a good target; it deserves more attention with new pad locations. Last year the angles at which we wanted to drill were restricted by our drill pad locations. This area has very broad, lower-grade mineralization, but it indicates that we are close to something. We could be fortunate, if we do our homework. Finally, there’s the old Noranda hole that was very similar to holes in the NBZ. New pad locations will help us there as well, it’s about 250 meters south of the NBZ. We’re trying to close the gaps between zones of high-grade gold. 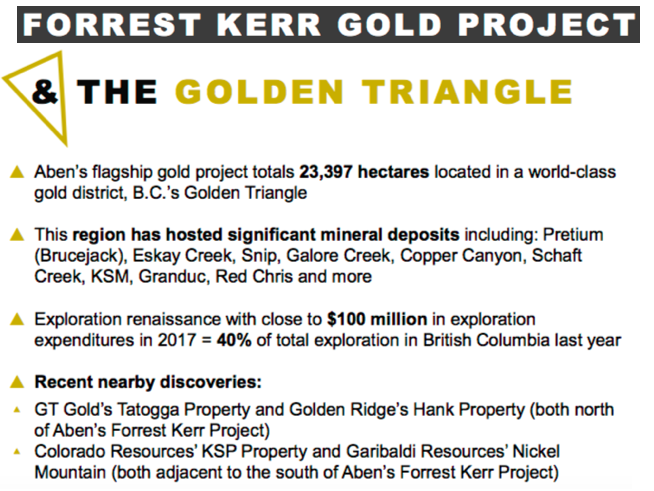 The Forrest Kerr project in British Columbia, Canada, the Golden Triangle, can you bring us up to date? After two years of drilling, we have a handle on the NBZ, but the overall area is 4 km long by 2 km wide. So, we’re starting with a sizable airborne geophysical MAG survey, with 50-meter spacing. It will be flown by helicopter and followed up with a drone to further define certain areas. We want to get a handle on the larger structural features. We need a large amount of definition to get a good handle on a pretty complex area. A lot of geological events have happened there. Lots of gold, but it’s all about getting a handle on where it’s coming from. If I were to say to you, regional stratigraphic contact, Hazelton/Stuhini, what would you tell my readers? How many Golden Triangle players are within 2 km of this contact? The Hazelton/Stuhini (HS) contact is the Holy Grail in the GT, but this “Red Line” theory that’s been touted by the BC Geological Survey isn’t just about that. Highly prospective properties must also have a correlating structural feature that’s fairly dominant, and within 2 km of each other. We are halfway between the HS contact and the Kerr Fault. Readers should understand that the Kerr Fault is the major structural feature in the entire region. We are in the prime discovery area. Around us everyone has staked ground, perhaps half are within 2 km of the Red Line, but not all are also near a major structural feature. Can you describe your management team’s and Board’s backgrounds? We have a number of people on our website, I will mention just a few. Tim Termuende is a director and is very active along with me, he started his career in the GT working under Ron Netolitzky, M.Sc. Geology. Tim is a P.Geo with over 30 years’ experience. He’s CEO of Eagle Plains Resources and a director of several other companies. Tim has very extensive experience in the Americas, but what we really like is that he has been involved in exploration within the Forrest Kerr, BC, area off and on since in the early 1990s. Chairman of the Board Ron Netolitzky, one of the best known names associated with the GT, is credited with three major gold discoveries in Canada that have subsequently been put into production; Eskay Creek, Snip and Brewery Creek. Ron really likes us, he’s known me and Tim a long time, we worked together in the Yukon, we get along well. Cornell McDowell is a really good field geologist, he’s VP Exploration, and is heading up exploration efforts at Justin as well. Mike McCuaig is a geologist with extensive experience in grassroots exploration, having worked on a number of projects across British Columbia, he’s a good, young Geo who’s been with us since 201112. He’s project manager at Justin. Can you comment on having Eric Sprott as one of your largest shareholders? Eric is probably one of the biggest gold bugs on the planet, an extremely successful and smart guy, he’s always looking for the next big discovery. With us, it was a pleasant surprise, I offered him $1 million in a private placement; he took $2 million. He’s excited about the GT, he knows Ron Netolitzky, and knows of Tim Termuende. Eric and I did some financings together before I sold Bayfield Ventures to New Gold. He’s a big vote of confidence in both Aben Resources and the GT. He believes in the cycle right now, that we’re moving into a gold bull market. He really likes the potential, the high-grade in the GT. And, he’s very cognizant that things don’t happen instantly. You are fully funded, what will you do with your cash liquidity? We are fully funded. Last year’s program in the GT was over $2.5 million, today we have ~$5.5 million; we’ve got more than we need. There will be a lot of exploration work and drilling in the GT this year. I may include some funds for the Justin project. We could do some low cost, shallow drilling. 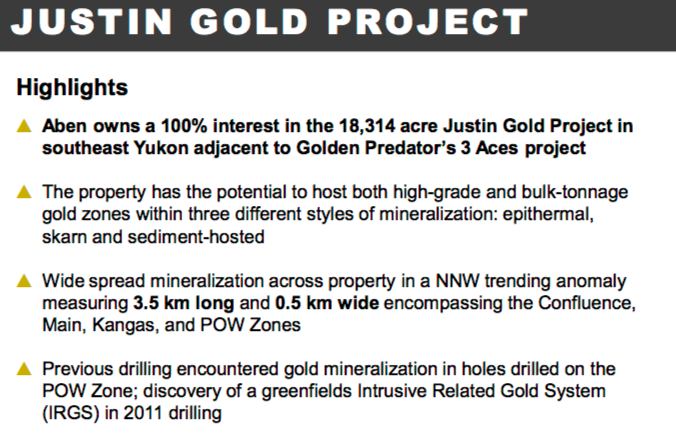 It would cost about $600,000 for 68 diamond drill holes on the POW zone, and a couple hundred grand for 20 shallow holes, which can be done quickly, and a couple hundred grand for more field work at Justin. It’s good to keep the treasury topped up; it allows us to expand if we hit something, to move quickly, that’s the key. What do you want the world to know about the Justin Project? What have your learned in the off-season that could make 2019 better than 2018 at Forrest Kerr? What would your team define as a successful season in the Golden Triangle this year? What would be the definition of success? Success would be to really get a handle on structure over a larger area, we have conceptually envisioned what we’re looking at there. The geophysics is going to help a lot, and that’s not our only tool, we have the geochem as well. Where we will probably have success is where you have the two working together. Geochem on surface, and the geophysics associated with it. We have enough information & experience to know that what we need is the deeper-seated structures, what’s causing it all. That’s going to help us, in terms of drilling, a lot, learning more about the structure. Why should readers consider buying shares of Aben Resources? For readers interested in discovery-stage companies, Aben Resources (TSX-V: ABN) / (OTCQB: ABNAF) / (Frankfurt: E2L2) has a lot going for it. First, the GT is known for high-grade gold. We love high-grade gold; it allows for a margin of error if gold prices aren’t as strong as we all like. Also, the GT is an area play, our stock will respond to good news from other companies in close proximity. Second, there’s great seasonality, a short exploration season, although we’re stretching it out with Justin, from November to March or April you can sometimes buy our stock at a lower price. Third, the gold market is getting better, I’m bullish on the gold price going forward and for the long-term. Disclosures: The content of this article is for information only. Readers fully understand and agree that nothing contained herein, written by Peter Epstein of Epstein Research [ER], (together, [ER]) about Aben Resources, including but not limited to, commentary, opinions, views, assumptions, reported facts, calculations, etc. is not to be considered implicit or explicit investment advice. Nothing contained herein is a recommendation or solicitation to buy or sell any security. [ER] is not responsible under any circumstances for investment actions taken by the reader. [ER] has never been, and is not currently, a registered or licensed financial advisor or broker/dealer, investment advisor, stockbroker, trader, money manager, compliance or legal officer, and does not perform market making activities. [ER] is not directly employed by any company, group, organization, party or person. The shares of Aben Resources are highly speculative, not suitable for all investors. Readers understand and agree that investments in small cap stocks can result in a 100% loss of invested funds. It is assumed and agreed upon by readers that they will consult with their own licensed or registered financial advisors before making any investment decisions. At the time this interview was posted, Peter Epstein owned no shares of Aben Resources, and the Company was an advertiser on [ER]. Readers understand and agree that they must conduct their own due diligence above and beyond reading this article. While the author believes he’s diligent in screening out companies that, for any reasons whatsoever, are unattractive investment opportunities, he cannot guarantee that his efforts will (or have been) successful. [ER] is not responsible for any perceived, or actual, errors including, but not limited to, commentary, opinions, views, assumptions, reported facts & financial calculations, or for the completeness of this article or future content. [ER] is not expected or required to subsequently follow or cover events & news, or write about any particular company or topic. [ER] is not an expert in any company, industry sector or investment topic. 2) The following companies mentioned in the article are billboard sponsors of Streetwise Reports: Aben and Victoria Gold. Click here for important disclosures about sponsor fees. As of the date of this article, an affiliate of Streetwise Reports has a consulting relationship with Aben Resources. Please click here for more information. The information provided above is for informational purposes only and is not a recommendation to buy or sell any security. 5) From time to time, Streetwise Reports LLC and its directors, officers, employees or members of their families, as well as persons interviewed for articles and interviews on the site, may have a long or short position in securities mentioned. Directors, officers, employees or members of their immediate families are prohibited from making purchases and/or sales of those securities in the open market or otherwise from the time of the interview or the decision to write an article until three business days after the publication of the interview or article. The foregoing prohibition does not apply to articles that in substance only restate previously published company releases. As of the date of this article, officers and/or employees of Streetwise Reports LLC (including members of their household) own securities of Aben Resources, a company mentioned in this article.